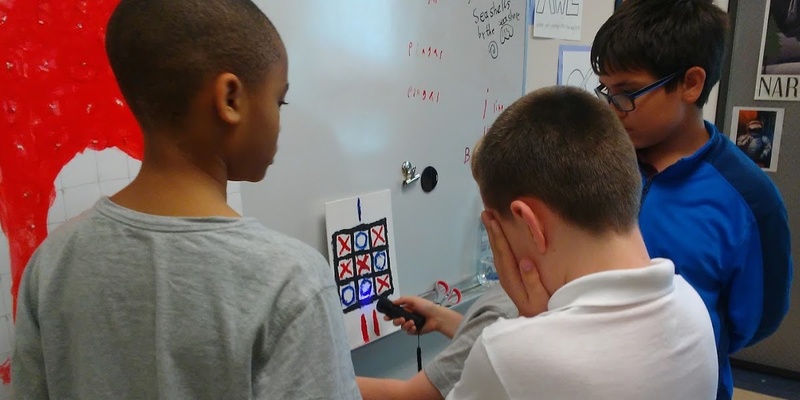 Our students, like most kids, really enjoy gaming. The incredible popularity of escape rooms, and the unique connection of taking a video game genre and bringing it into the physical world was was too good to pass up for our projects class. Here is an outline of our projects-based learning adventure that I hope you can adapt for your own students! Engage collaborative learning: build team dynamics & cooperation, learn how to deal with failure, and develop leadership, organization, and decision-making skills. Weave our arts and humanities studies throughout our projects curriculum: Promote creative thinking through storytelling, game design strategy, and hands-on building. Teach students proper and safe usage of hand tools. We started with a core competency unit on hand tool usage and safety. 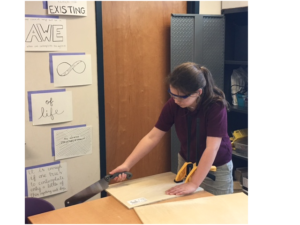 Each student was responsible for researching a single tool and presenting their findings along with a safety demonstration of their tool to the class. We looked at some escape rooms on youtube and distilled a list of the common types of puzzles that we saw being employed. These included word locks, acrostics, directional locks, puzzles that involve switches or electrical engineering, black light writing, and hidden keys. Each student proposed puzzles and connections to building the story and path through their escape room. For example, one student decided he wanted to tie the solution for the directional lock to the arms on the clock. Cool! Once we workshopped and agreed on the best puzzles, we defined the order in which they would be solved. The puzzles evolved and changed as we weaved the ideas together. The students brainstormed and chose their own themes for their project. In the end, one class decided to do a “Viking Quest” and the other, “Escape from Ellis Island.” These are wonderful extensions to the units the kids are doing on immigration across history. As I allowed the students to self-group and self-select their activities, we also added things like an opening and closing video, souvenirs for the people who manage to escape the room, and additional paintings to enhance the themes in their respective rooms. Once a plan was in place, the students then got to work designing and building the physical artifacts that would be in our room. These ranged from locked chests, electrical grids, and scrabble boards, to paintings, crocheted satchels, and ancient maps to bring their concept to life. Students worked really well together and were willing to listen to each other’s ideas and cooperate. There were some frustrations: feeling like an idea or suggestion was not adequately taken into consideration by the team; an inability to execute a project to the ideal imagined; or working on difficult projects for a sustained period without having the option to switch. This is one of my greatest joys in teaching projects at Grayson. By working through these issues and frustrations together, the students gain so much more from their learning—teamwork, sharing leadership, and actual life and executive functioning skills they need. When I noticed that the students gravitated towards areas of strength and expertise, I provided suggestions and challenged them to to push themselves outside of their comfort zone. As their work progressed, I noticed the students growing more comfortable and likely to revise their work, redoing things that went wrong, and coming up with a new plan of attack. When completed, both classes will then get to solve the challenges in each other’s rooms. I am SUPER impressed with the tight-lipped nature of both classes; no one has given up any secrets and both classes on their own have started clandestine subterfuge by planting fake clues in their rooms! I will act as the GameMaster and be in the room to offer hints and answer questions in either team gets stuck. 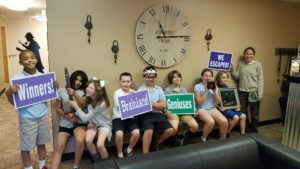 Our class trip to Expedition Escape in King of Prussia allowed the students to compare and contrast their own rooms with the challenges that a commercial experience had in store for us. Working together as a team is a common theme in our projects classes, and something that our students have been working very hard on this all year, so we had high expectations for our field trip. Our two teams did REALLY well in both situations! As teachers, this stirs up so many feelings. The failure-adverse perfectionists we met in September who walked into escape rooms, willing to take a risk and be wrong. We see the strong-willed types who struggled with listening, as they paused to consider other’s ideas in building out each aspect of a story and challenge. We see genuine respect and trust that can only come from relying on each other as experts and teachers. We see the fulfillment of our founder, Melissa Bilash‘s vision and the support of all who made that vision a reality! On the last day of school, we celebrate Founders Day and showcase many of our accomplishments for our families. We thought it would be fun to challenge our families with the escape rooms that we created as an experiential way to present our work. The adults were met by a few difficult challenges from our students, and everyone had a great time! If you are interested in creating an escape room in your classroom, here is a cool infographic to guide you! Ally O’Rourke-Barrett is Director of Projects-Based Learning, and drives 88 miles every day to be able to spend her days at Grayson with gifted children. Her students call her “Ms. O” because her classroom is too busy with activities to wait for them to finish saying her entire surname. This year she can be found trying to solve mysteries or building some robots. Fantastic work! If you aren’t already, we’d love to have you involved in our Breakout EDU project. 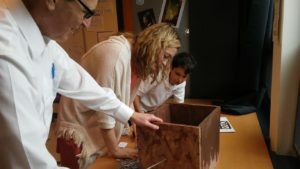 Your idea about using an escape room to help students learn decision-making skills is very attractive! 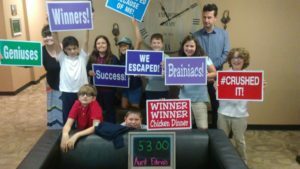 I homeschool my son, but I definitely think that he could benefit from that as well as the critical thinking skills that you learn when you play escape room games. 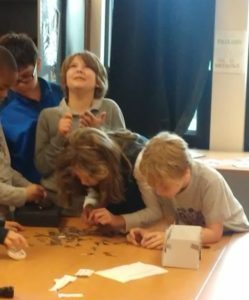 Perhaps I’ll get a group of my fellow homeschool moms and see if we can visit an escape room somewhere with our kids to help them get some ideas for building their own. Katie – I think you will find it to be a great activity. Especially if you can form two “teams” so they can each build and try to escape a room. Ms. O, who conducted this class put together an outline you might find helpful as you develop your own. Let us know how it goes! Our kids had so much fun, we took our faculty to an escape room for some team building during August orientation and we had a blast!